My 100 Day Project started on 2nd April. For obvious reasons I thought 1st April wouldn’t be a great starting day. We’ve all seen 7 day challenges, ’30 days of [whatever]’ challenges, and now the 100 day project. Anything above 21 days is designed to build a creative habit. There’s a temptation to think we’re going to miss a day or two so we shouldn’t even start. But anything that helps build a creative habit is helpful. The 100 day website suggests only 5 minutes a day is spent working on your chosen project. Drawing for 5 minutes a day may achieve something, but I find painting takes longer. One of the biggest barriers to painting is the blank sheet of paper at the outset. And that’s part of why the 100 days is so effective for me. Just like that thought that if we can’t do every one of the 100 days, we shouldn’t take part – I have a block about getting started on a painting if I don’t have a few hours available to paint. So one of the things the project does is get me working on something in my studio or with my paints even if I only have a short time available. Daily practice is key. Try to use this time as an incentive to do just a small amount every day. 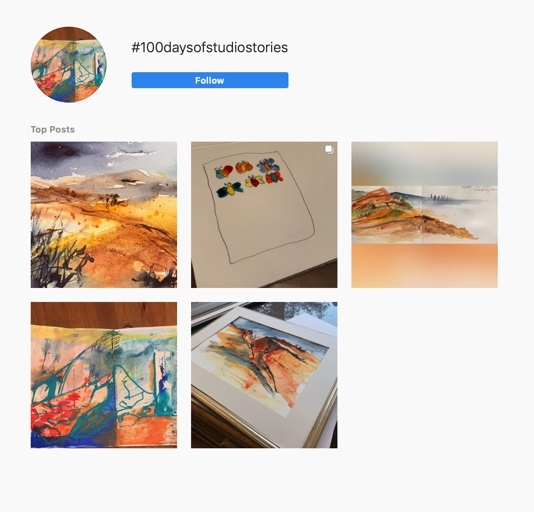 The 100 day project is a great way to share a series of Studio Stories giving followers some insight into the steps that go into producing a painting. If you’re an artist, consider joining in the 100 day series. If you’re an art lover, there may be some new discoveries to be made by following the #100dayproject hashtag on Instagram. Why does the project really work for me? It is a great motivator. An encouragement for me to get something done every day if possible. There’s an extra focus when the artwork is part of a project. I had to think about a theme: focused without being monotonous. Discovery: It’s a great way of finding other artists who are also working on developing their practice. Promotion: Its also an excellent way of being discovered by people who love art and follow art Instagram accounts. I’ve created a new hashtag for my posts for this project. If you want to see how I’m getting on with my project, use the Instagram hashtag: #100daysofstudiostories. On a different note: I’m planning to do a monthly newsletter with a round up of the blog posts I think will be most useful as well as anything else in the art world I come across. If you’d prefer to read a monthly newsletter instead of a weekly blog post, why not sign up for my newsletter. The signup form is the teal box on the right hand side of the page. And the unsubscribe button is right there too if you change your mind later.